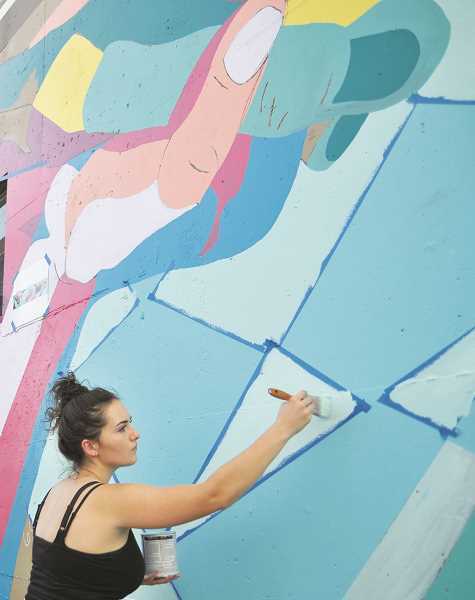 It's been more than two years in the making, but four George Fox students have brightened up one end of downtown Newbeg after completing a vibrant mural they hope will simultaneously celebrate and engage the community. Sponsored by Newberg Noon Rotary, Benjamin Cahoon, Jared Mar, Sierra Ratcliff and Annabelle Wombacher recently finished painting the east-facing wall of Steve's Auto Service on Hancock and Meridian streets. 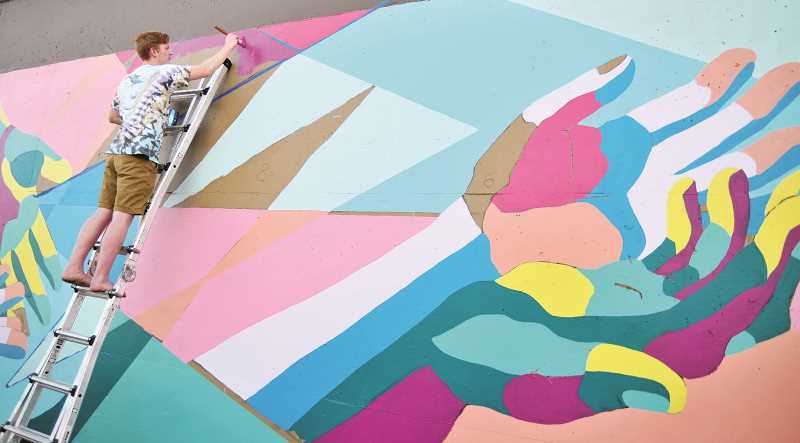 The foursome collaborated to create a design that features three sets of hands -- representing the Rotarian values of community, service and connection – set against a background of brightly colored geometric shapes. The group will celebrate its completion with a public opening from 3 to 5:30 p.m. Saturday. "We feel like it's a really great way to welcome people who are passing through, but also to welcome Fox students because that's what we are," Wombacher, a junior, said. "It brings a lot of things together and we hope it embodies what Newberg stands for – just being a community that cares." The group's piece is the first created through the Yamhill County Mural Project (YCMP), the brainchild of GFU art professor Luke Zimmerman. He said his hope is to create a second mural in Newberg this school year, then expand to other communities in the county as soon as 2019-2020. "I'm really interested in the social engagement of the arts and the role it can play in community development," Zimmerman said. "Murals have a very strong tradition of playing that role." The project's first attempt was a mural on campus during the 2015-2016 school year, but that eventually fell through. Last year, Zimmerman connected with Geoff Gilmore of Newberg Noon Rotary, who not only came through with funding but also served as point man for securing a location for the mural. Zimmerman put out a campus-wide call for students to apply to join the project and partnered with career and academic planning coach Kaitlyn Ragan of the George Fox's IDEA Center to make it a paid internship and professional development opportunity. Six of the 12 students who applied were interviewed and all six received feedback to help develop their career skills. The foursome certainly got some real-world experience in project management as they worked with the city of Newberg to get a permit and make sure the mural was up to code. That involved numerous tweaks, a lot of waiting and certainly some frustration. "It's really nice as a teacher when something doesn't go just as planned because the students have to pull on other skills, show resilience and decide if they're really committed," Zimmerman said. "It's been a good process. Everybody has been supportive." Mar and Wombacher had been a part of the project in 2015-2016, with Cahoon and Ratcliff coming on board last year. It took the foursome a little while to get past their tendency to be overly nice and learn how to work together constructively to create the design. "In groups like that, it's really easy to be too nice and not end up with good work," Zimmerman said. "You just end up with work that doesn't offend everybody in the group, but that nobody's actually happy with. I think pushing into that kindness, pushing to do better, then really building on each other's ideas was a big learning for them." The students also had to incorporate Rotary's needs into the piece, but through the design process they began understand how to utilize their strengths and carved out more defined roles. Cahoon, for instance, designed the majority of the background. "Each person has a different aspect in this that highly represents them as artists, which is really cool," he said. "We were really worried about that going into it, but we can proudly say that each of us has high stakes in this." Mar, a junior from San Francisco, is more focused on sculpture at Fox, but designed the hands. The pair of hands at left are open and tilted down to evoke "giving," with the middle pair open in a way that conveys receiving and the third clasped together to represent coming together or community. "I grew up around graffiti and street art and murals at home and I've always been in love with them," Mar said. "It's great to actually work on one out here. I've missed them a lot since moving out here for school, so it's cool that I got to help put one up." Wombacher took the lead on choosing color, opting for near-pastel pink, blue, purple and greens to make it "vibrant, eye catching and really bold and modern, rather than something stagnant." "We really wanted it to stand out, be fun, engaging and visually stimulating rather than being just blue and green like the rest of Oregon," the junior from Tacoma said. Ratcliff handled all the digital aspects of the project, like translating a photo of the wall into a canvas the others could use to create the design. She then digitized their design and projected it on to the wall so that they could trace it with charcoal and then begin painting in mid-August. Although it was their first choice, as the group initially prioritized finding a space closer to the center of downtown, the wall at Steve's Auto service has incredible visibility. For those driving southwest on Highway 99W, the mural will pop into view just after cars pass the "Welcome to Newberg" sign. "Steve has been unbelievably incredible in this process," Cahoon said. "He has been so accepting of everything that we've done and really has given us full artistic freedom and trust in Rotary and us as artists. We can't speak highly enough about Steve." Unfortunately, the mural was defaced with graffiti over the weekend, but Zimmerman said he expects it to be cleaned up and ready in time for the opening Saturday. He added that dealing with challenges like that is part of the learning process. "The idea is to help these students get up to speed on how to develop an idea, go through the process a couple of times and then hopefully use them in lead positions on the countywide versions of the project next year," Zimmerman said. "So it's giving them a chance to take even more leadership in this and really own something."